Project scoring allows the projects in the portfolio to be prioritized according to some predefined criteria and a structured scoring process. Scoring can also be helpful as part of the gate review process in determining the value of the project to the organization and if ongoing investment is warranted. The scoring table can be set up to use 1 to 10 or 1 to 3 point scoring ranges. The weighting factors are automatically applied to the scores to calculate the overall score for the project. 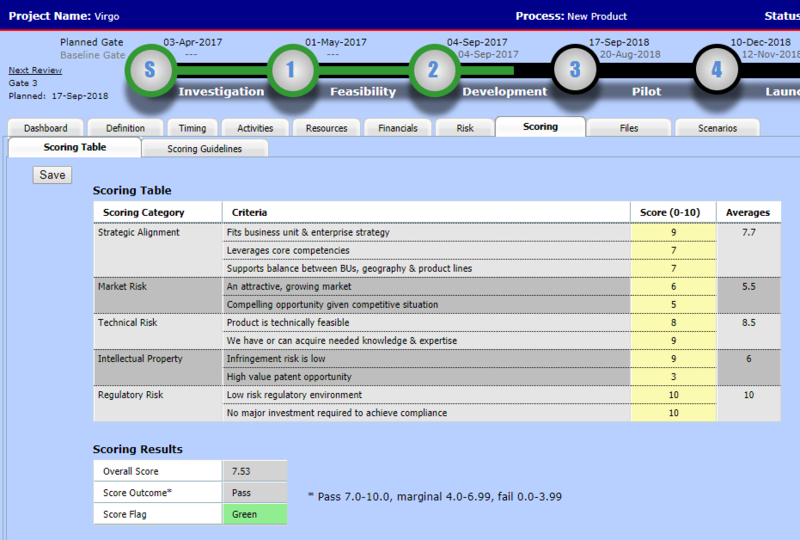 The thresholds for determining the Score Outcome and Score Flag are configurable. The worksheet also captures assumptions or comments related to the scoring.